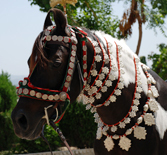 "Commemorating the loyalty of legendary horse Chetak towards Rana Pratap by caring for animals"
The Chetak Trust receives support from the Government, specifically from the Department of Animal Husbandry, for conducting joint programmes for the welfare of animals. 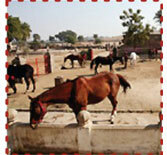 Shikarbadi Hotel essentially supports the activities of Goverdhan Trust in breeding of Marwari horses, as this parcel of land settled in the Trust was originally a part of the old Shikarbadi complex. Organisations: Goverdhan Trust and Shikarbadi Hotel Pvt. Ltd. Animal welfare activities such as animal health fares will be organised in future by Shree Eklingji Trust under Shiv Shakti Peeth. The business and charitable organisations under Eternal Mewar continuously engage in activities for the welfare of animals.